Sake can be a delicious drink that is rather rewarding to make for yourself. 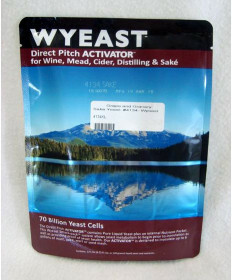 We are happy to offer high quality Wyeast Sake yeasts along with Koji-Kin sake molds. If you have any questions about brewing sake please Contact Us. We love hearing from our customers and helping them perfect their brews. Sake is a traditional Japanese drink made from fermented rice. This drink has been around for over 2000 years now, often being used in religious ceremonies in ancient Japan. Sake dates back all the way to the Kojiki - the first written and recorded history of Japan. While the brewing process has changed over the centuries, the traditions revolving around the drink have remained largely the same. We hope that you will take in the culture of sake and share it with family and friends alike!